NEW ORLEANS — We’re almost one full month into the 2017 collegiate track & field season and we’ve already seen some incredible efforts. Just last weekend UTEP freshman Emmanuel Korir scorched the track over 600 meters to set an all-time world best of 1:14.97. Another freshman, Florida’s Grant Holloway, currently leads the NCAA in the 60 hurdles and long jump and is the first man with superb marks in both indoors since recently retired two-time Olympic gold medalist Ashton Eaton. Let’s not forget about Oklahoma State’s Kaela Edwards either. Edwards set a collegiate record in the 1000 with a time of 2:40.79 in her season debut. Those three athletes could very well find their way on the next The Bowerman Award Watch Lists when they come out February 1 and 2. 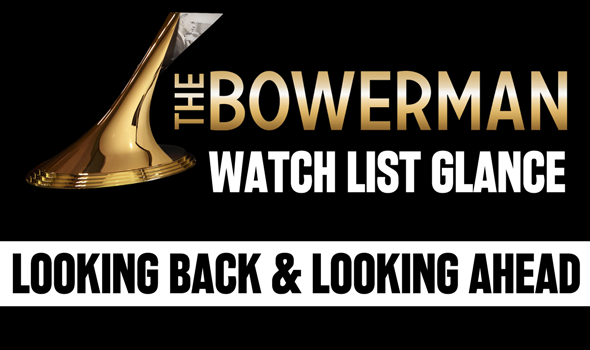 But for now, there are 10 men and 10 women The Bowerman Award Watch List Committee deemed necessary to honor with that distinction to this point of the season. Let’s take a look at what those athletes have done and where they’ll compete this weekend as the 2017 season continues to pick up steam. Edward Cheserek, Oregon: Cheserek makes his 2017 debut at the East-West Challenge this weekend at The Armory. Cheserek will compete in the 3000. Christian Coleman, Tennessee: Coleman has three meets under his belt this season and one truly stood out. He went 6.56 or better twice in the 60 at the Commodore Invitational two weeks ago. Coleman, the reigning indoor 200 champ, will compete in that very event this weekend at the Razorback Invitational. Eric Futch, Florida — Futch has yet to make his 2017 debut. Filip Mihaljevic, Virginia — Mihaljevic has yet to make his 2017 debut, but will this weekend. Mihaljevic will compete in his signature event — the shot put — at the Darius Dixon Memorial Invitational inside Liberty’s brand-new facility. Michael Norman, Southern California — Norman has yet to make his 2017 debut. Byron Robinson, Texas — Robinson has yet to make his 2017 debut. Curtis Thompson, Mississippi State — Thompson has yet to make his 2017 debut. Lindon Victor, Texas A&M — Victor competed in multiple events at two meets this year but will put it all together in the heptathlon this weekend at the Razorback Invitational against a strong field. Last year Victor scored 5646 points in his debut. Rudy Winkler, Cornell — Winkler will make his 2017 debut this weekend at the East-West Challenge in the weight throw. It was a long track season for the Cornell standout as he took part in the 2016 Rio Olympic Games. Henry Wynne, Virginia — Wynne, the 2016 mile champ, makes his 2017 debut in the 3000 at the Darius Dixon Memorial Invitational. Quanesha Burks, Alabama — Burks has yet to make her 2017 debut. Jasmine Camacho-Quinn — Camacho-Quinn made her 2017 debut at the Hoosier Open back in December and finished 2nd to an unattached Devynne Charlton in the 60 hurdles. The Kentucky sophomore pulled triple duty that meet (200, 4×400). Keturah Orji, Georgia — Orji has two meets under her belt this season and posted two winning marks: one in the long jump (6.51m/21-4¼) and another in the triple jump (13.95m/45-9¼). She is back at it again this weekend at the Razorback Invitational where she’ll compete in the long jump. Raevyn Rogers, Oregon — Rogers competed earlier this season, but will make her debut in the 800 this weekend at the East-West Challenge. We could see a fast time with her in the same heat as Cecelia Barowski and teammate Brooke Feldmeir. Raven Saunders, Ole Miss — Saunders is back to her old tricks. The Ole Miss star unleashed a throw of 19.10m (62-8) at the Commodore Invitational two weeks ago. She’ll look to add another titanic heave to her resume this weekend at the Razorback Invitational. Molly Seidel, Notre Dame — Seidel opened her season at the Notre Dame Invitational last week with a win in the mile (4:44.75). Deajah Stevens, Oregon — Stevens makes her 2017 debut this weekend at the East-West Challenge and could pull triple duty (60, 200 and 4×400). Ariana Washington, Oregon — Washington makes her 2017 debut this weekend at the East-West Challenge and is scheduled to run in the 60 and 200. Lexi Weeks, Arkansas — Weeks opened her season two weeks ago at the Arkansas Invitational with a runner-up effort in the pole vault. She’ll compete at home again this weekend during the Razorback Invitational. Kendell Williams, Georgia — Williams makes her 2017 multi debut this weekend at the Razorback Invitational. She won the pentathlon title at that meet last year when she scored 4558 points to beat Arkansas’ Taliyah Brooks.